a) Publish the following amended Schedule 1 for public commentary in terms of the National Small Enterprise Definition as contained in the National Small Enterprise Act, 1996 (Act No. 102 of 1996), read with the National Enterprise Amendment Act, 2003 (Act No. 26 of 2003) and the National Small Enterprises Act, 2004 (Act No. 29 of 2004). c) The closing date for the receipt of comments is set as 30 days after publication of this Notice. Introduce new threshold values to account for inflation since the Schedule was last revised in 2003; Define small enterprise using two proxies instead of three i.e. : total Fulltime Equivalent of Paid Employees and Total Annual Turnover; Remove the third proxy of Total Gross Asset Value in the current definition as the proxy is often inappropriate and difficult to measure; and Remove the size or class category of “Very Small enterprise” which is part of the current definition and be subsumed into the category of “small enterprise “, as many users found this size or class category unhelpful and inconsistent with international practice. 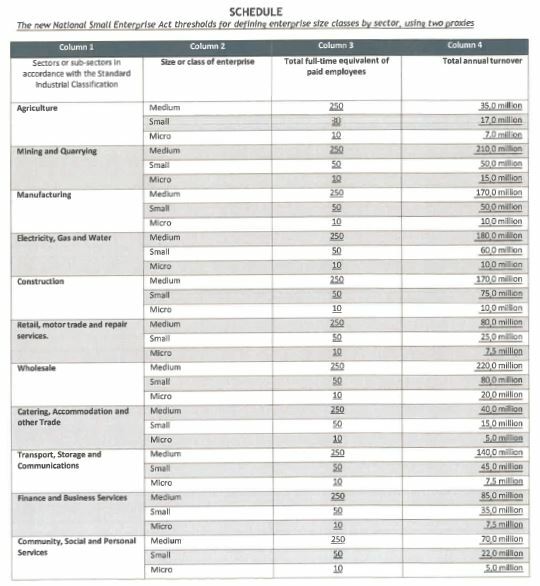 from the statistical data generated by the SARS -NT panel; Adjust year on year for inflation (6 %) to determine the sector cut -offs until 2020; Collapse “very small firms” (between 5 and 20 employment) with “small firms “; Eliminate assets as a proxy since the asset proxy is difficult to administer due to complexities relating to the verification of assets and their actual values. This is further confirmed in the SARS -NT dataset based on the CIT data; and Update the SIC classifications and thresholds with Statistics South Africa data which are more accurate and based on company surveys. (1) These size classes will cover all forms of ownership and enterprise structures, including sole proprietors, partnerships, companies and cooperative enterprises; they also apply to formal and informal enterprises. (2) In defining these class sizes, three proxies were used: (1) number of people employed, i.e. : full time equivalents, (2) value of annual turnover and (3) value of assets. (3) The review into the use of the definitions and proxies found that many public and private agencies found it difficult to apply all these proxies and that the threshold value of turnover and assets were often inappropriate and difficult to measure. Thus, it is recommended that two proxies are used to define enterprises of different size classes. (4) Furthermore, consultations during the review found that the size class of “Very Small Enterprise” is not consistent with international practice and many agencies in South Africa found it to be unhelpful. Thus, it is recommended that the term “Very Small Enterprise” be abolished and subsumed into the size class of “Small Enterprise “. Purpose of a national definition of small enterprise – A national definition of small enterprise is required to officially identify small enterprises in order to: (1) Inform the design, management and assessment of business support measures (i.e. : programmes and services) in national and sub -national (i.e. : provincial and local) territories. (2) Measure change in the business sector (i.e. : statistical analysis). (3) Promote consistency in the use of terms in order to align government policy and legislation. The new definition introduces three different categories of enterprises: Small, medium and micro enterprises; and two proxies of total full time employment and total annual turnover. (4) Remove the size or class category of “Very Small enterprise” which is part of the current definition, and be subsumed into the category of “small enterprise “. Many users found that this size or class category unhelpful and inconsistent with international practice.